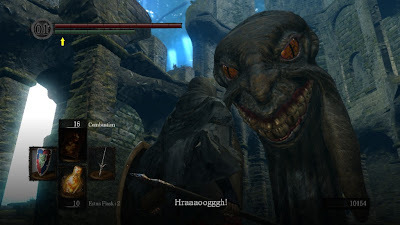 Dark Souls is a great, dark fantasy RPG. It is set in a post-apocalyptic fantasy world, where vile creatures are everywhere and nowhere is safe. 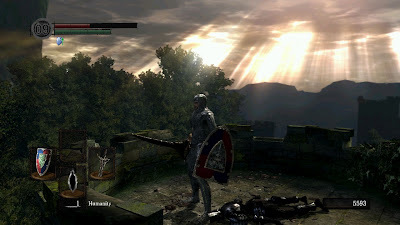 The game's atmosphere is very intense and immersive, thanks to beautifully-crafted locations and dramatic music that usually plays during boss fights. The flow of the game is sort of semi-linear, meaning that more often than not there is a choice of several locations to do in your own order of preference and in many of those locations there are branching paths, often leading to shortcuts to the previous locations, hence saving you the time in case you wanted to go back. The game starts with a mindblowing intro which gives us a little backstory of the setting and shows some of the characters that appear later in the game. It is easily one of the most captivating intros out there. 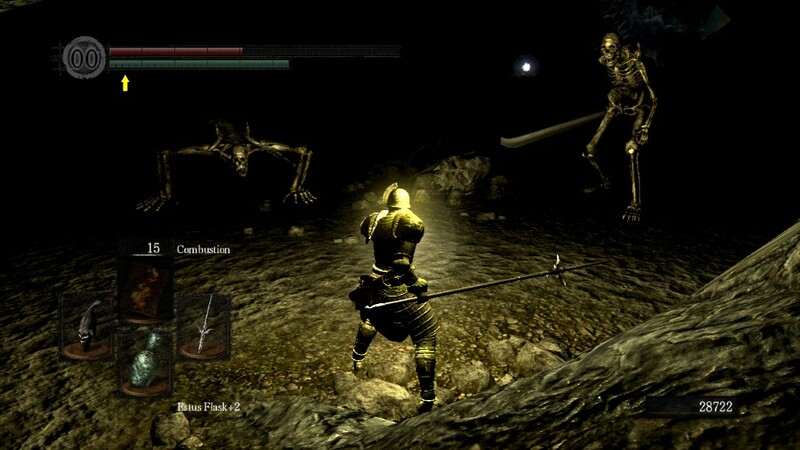 Now of course one of the most defining features of Dark Souls is its high difficulty. However, it is quite unlike most other challenging games out there. The way it is designed, dying is an important part of the game, and hence the words 'Prepare to Die' have to be taken seriously. 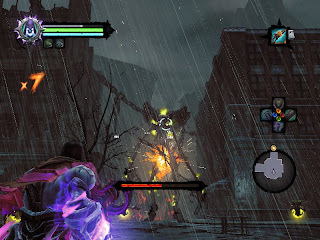 The players should expect to die frequently, at which point the game simply continues and returns them back to the last bonfire (checkpoint) rested at with all enemies respawned. The trick is not about trying to avoid death altogether, but about picking yourself up and learning from your mistakes. It's a tactical game in that regard, because every enemy and every boss requires the right approach, and until you approach them with the correct mindset, they will keep beating you again and again. Admittedly sometimes it can be annoying having to walk big portions of the area and fighting the same enemies to get back to the boss fight, but it is almost always well worth it. Dark Souls is not a button masher. It's not about how fast you can hit the attack button, but more about your timing, patience, concentration, and battle strategy. Its premise is quite simple really - persistence and determination pay off. Initially a lot of the game seems overwhelming and many areas and bosses seem impossible, but eventually any challenge can be beaten. There have been times I thought to myself “There is no way I can pull this off”, but after trying numerous times and adjusting my strategy accordingly, I found myself magically overcoming everything. As a result you get an overwhelming sense of reward and accomplishment after having beaten any challenge in the game. As far as I noticed, the game has two major learning curves, and that’s when most people are likely to give up on the game. The first learning curve happens in the first post-tutorial level, the Undead Burg. That’s when the player learns the basic tactics of combat and gets into the mindset of finding ways to make their own rules in combat as opposed to what the game tricks them into doing. For example: luring the enemies out into safer battle ground, fighting one on one as opposed to a group, and so on. 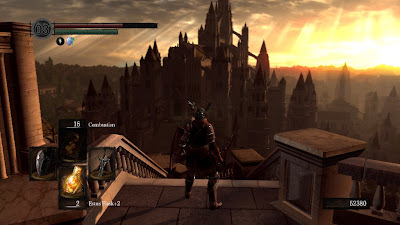 The second learning curve happens at around halfway point in the game, the area called Anor Londo. This is because at this point perhaps the sharpest rise in difficulty is felt as every enemy there is tough. 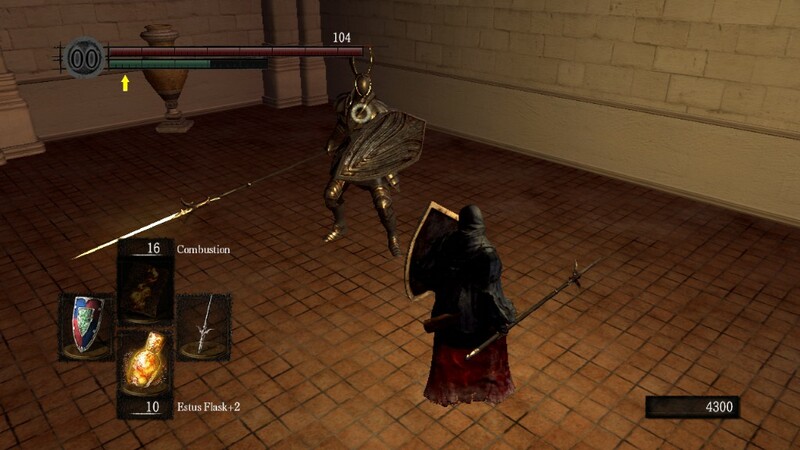 This area is the one where players are turned from marginally competent into expert combatants. One of the interesting aspects also is how players can leave messages on the ground, hence allowing other players to see them and this way indirectly interact with each other. Many of those messages are helpful warning signs, giving tips on how to handle a tough enemy ahead or notices about a treasure hidden nearby, but at times there'd be some which are meant to mislead you, so player discretion is required at all times. 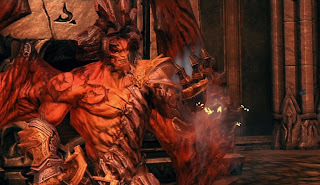 The game excels at many things, but if I had to pick the one thing it does best, then I’d go with the boss fights. 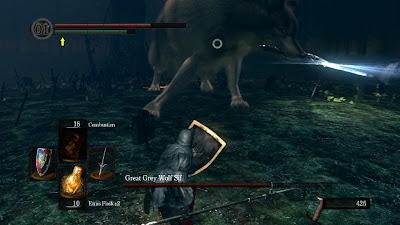 These are some of the most engaging, most punishing, and ultimately most rewarding boss fights I have ever experienced in gaming. There are plenty of them scattered throughout the game, some are compulsory to progress further, whilst others are completely optional. The boss fights is also when most of the game’s fantastic music scores tend to play in order to set the scene and give a sense of dread and doom. Also want to quickly cover the Artorias of the Abyss DLC, which is already included in the Prepare to Die edition. 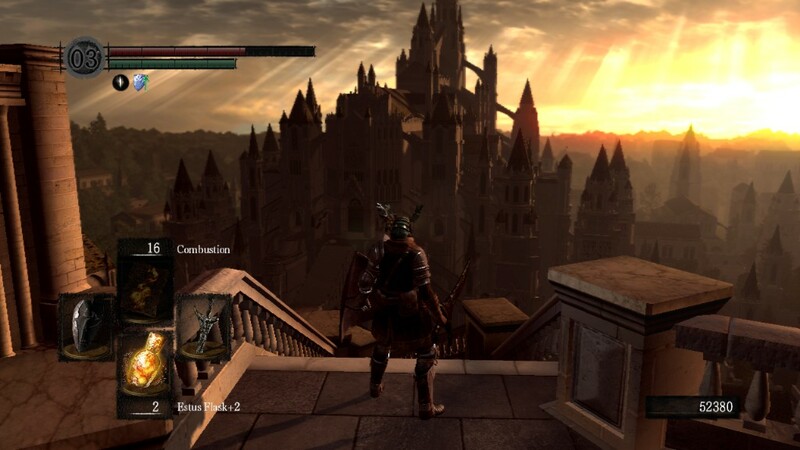 It’s pretty all right for a DLC. It gives a few new areas for the players to explore and also pits us against some really challenging bosses, even more challenging than most bosses in the original game, but once again - very much worth it. Now I want to also mention some criticisms. Although I absolutely loved the game, it does have some drawbacks too. Well, first of all it’s important of a mention that the PC version is a pretty bad console port. Not only using mouse and keyboard feels awkward, but also most of the in-game instructions tend to refer to the buttons on an Xbox controller. However, simply acquiring a gamepad solves the whole problem. Therefore I would highly advise the use of a gamepad/controller to play this game on PC. Now for another small criticism - one of the game’s features is that players can invade each other’s worlds and have a PvP. However, what I noticed is that this feature is a bit out of control and in some areas you get invaded every few minutes and more often than not the invaders have better gear and higher level than you, which can be only irritating when playing an already difficult game. It just feels that the PvP aspect is forced upon all players, even though some might not be wishing to engage in it. The only way around that is to play most of the game on hollow mode. 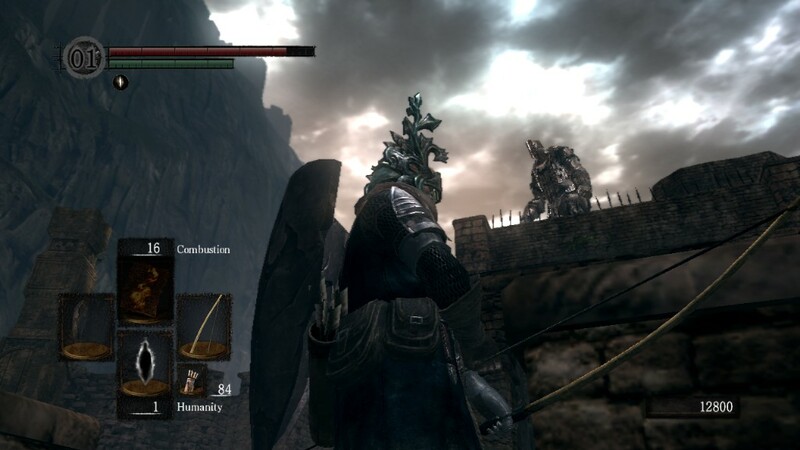 It has some drawbacks, like not being able to summon NPCs to help you in boss fights, but the game can still be played in its entirety like this, with only maybe occasional reverting back to human form to kindle bonfires and that’s it. 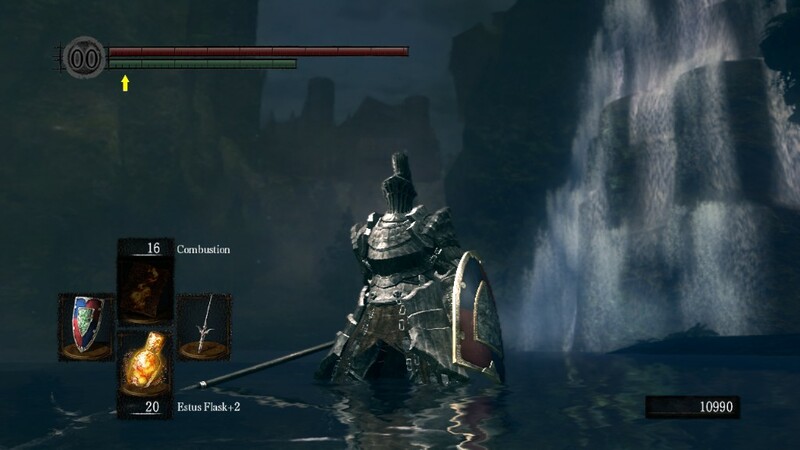 Dark Souls is certainly not for everyone. From what I’ve seen so far, people either love it or hate it, but you never know until you first try it, which is why I am very glad I’ve decided to do so after a recommendation by a friend. If you're looking for a casual and relaxing game, Dark Souls will not fill that niche, but it is definitely worth looking into if you’ve ever for at least a minute wanted something challenging and intense. It’s one of a kind game, delivering an incredibly immersive experience and making you shed blood and sweat in order to gain victory. So, after enjoying the first game I went straight for the second one. 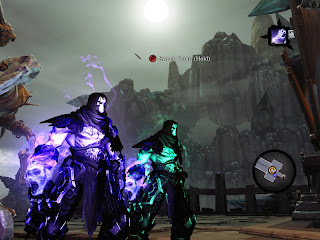 In Darksiders II we play as the Death horseman, who sets out to clear his brother’s name. It straight away becomes obvious that the events of this game happen right before the first game, but after the apocalypse, whilst War horseman is still held captive by the Council. During this journey, Death visits a lot of different locations across the realms, ranging from the Forge lands, then to the Kingdom of the Dead, then to Lost Light (Angel land), with a chance to visit Earth, and finally to the Shadow’s Edge (Demon land). There are some very noticeable differences between the two games. Firstly, Darksiders II plays more like an RPG than the first game, allowing the player to level up, learn new skills along skill trees, and change equipment. I thought all these were great additions and certainly a step in the right direction. It also has a noticeable drop in difficulty. 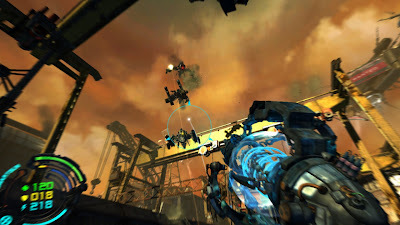 Normal mode in this game felt easier than Easy mode in the first game, but that is not necessarily a bad thing as the game can appeal to a lot of casual gamers out there. 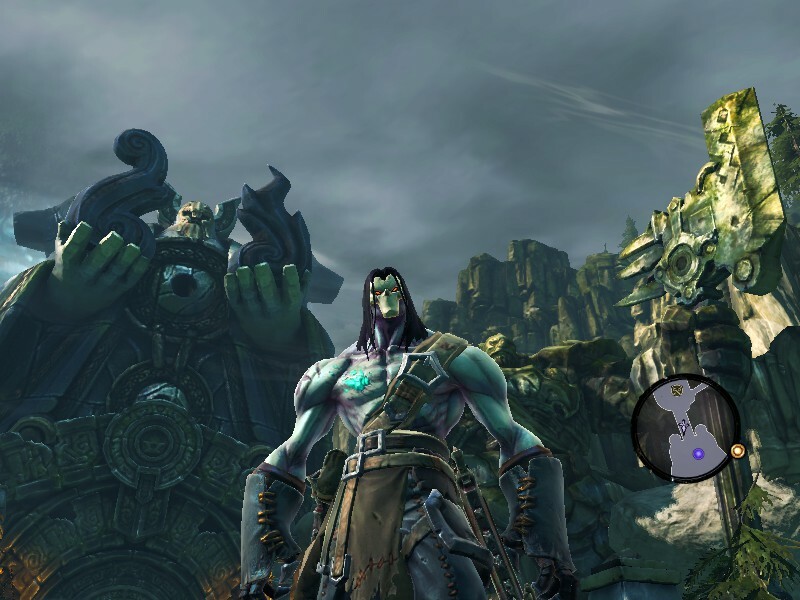 There were things I really enjoyed about Darksiders II and there were plenty of improvements over the first game, but there were also some really bad design flaws which brought the overall quality of the game down a notch. 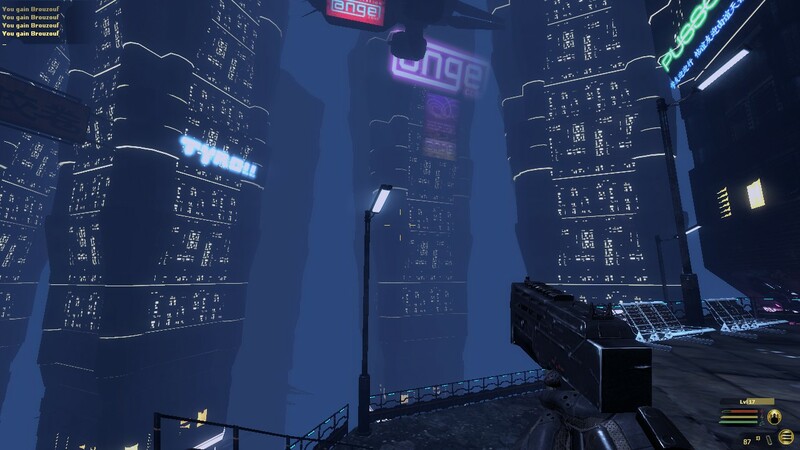 Straight away the first impressions of the Prologue level and the first land are really high. Very beautiful environments, fantastic music, and very easy and enjoyable combat mechanics. 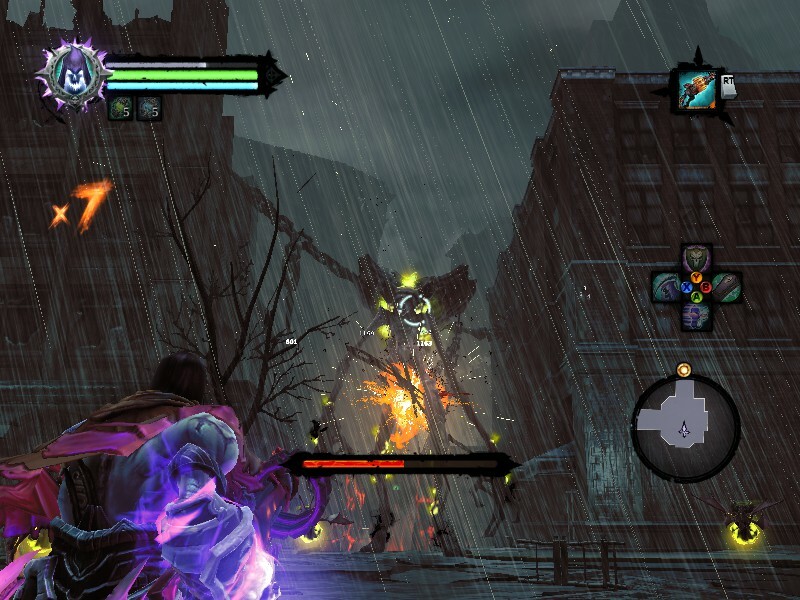 I liked it that with Death we could really pull off some cool fights and manoeuvres as he is a lot more agile than War. 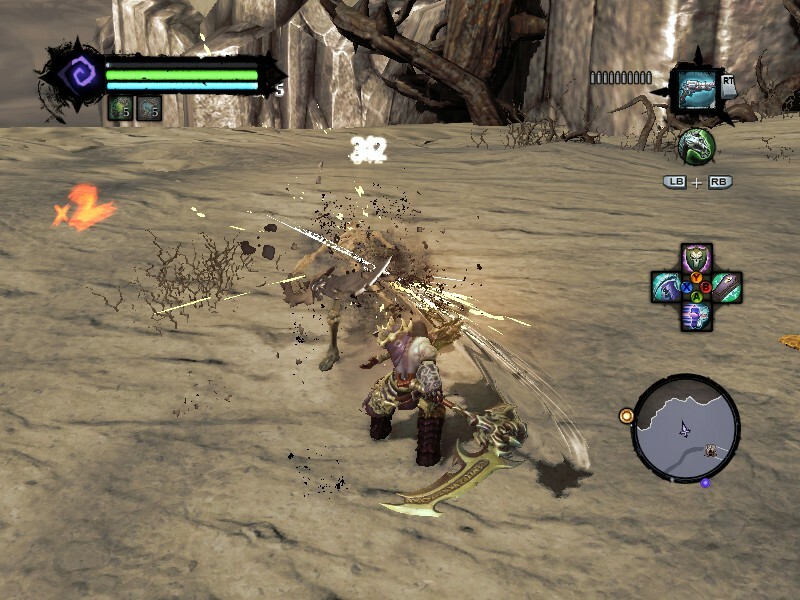 And although there weren’t too many different combos with the primary weapons, the combat was still very engaging and every battle felt like it was straight out of an action movie. 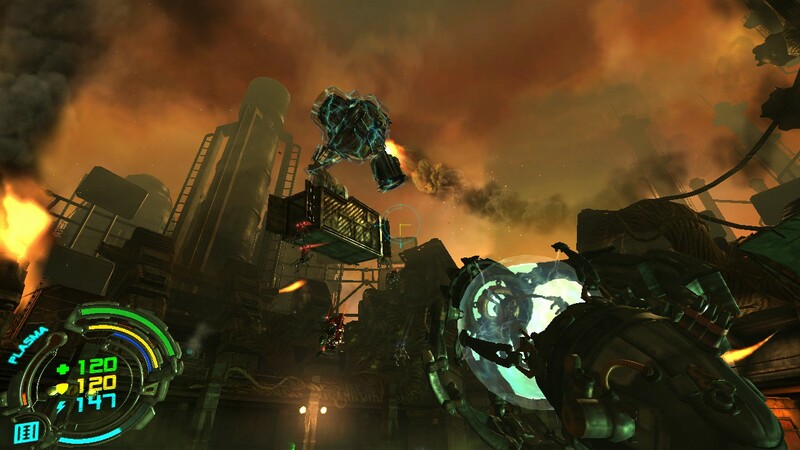 The platforming and climbing features were done pretty well too, with a variety of diverse techniques given to traverse different obstacles, even though at times it felt a tad rigid and slow, usually when attempting to quickly move from one ledge to another. In latter stages of the game there were some nice locations. I personally really enjoyed the part when you had to visit the ravaged Earth. 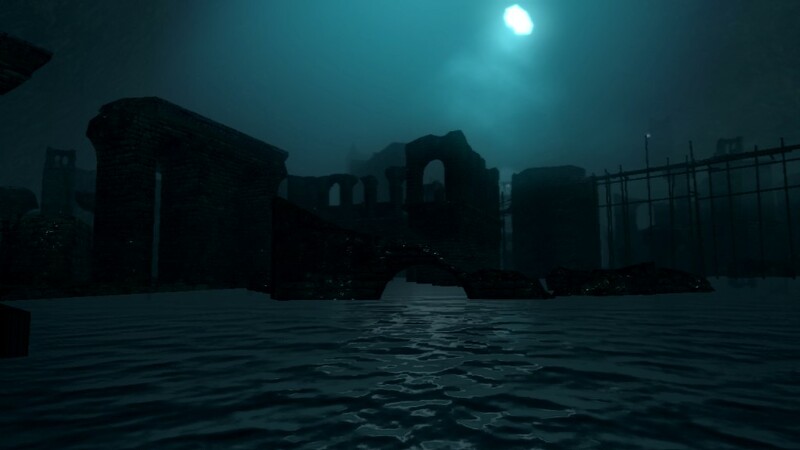 The tone and the atmosphere in that level were really moody and depressing. Thunderstorm, broken buildings, lovely ambient tune, and of course a slightly new addition to the gameplay – the projectile weapons. And shortly after that level the Shadow’s Edge (Demon land) was pretty nice too, with its golden-red colour tones and a sense of chaos and destruction that had occurred there not long ago. Being able to travel backwards and forwards in time was a pretty cool addition during that level too. 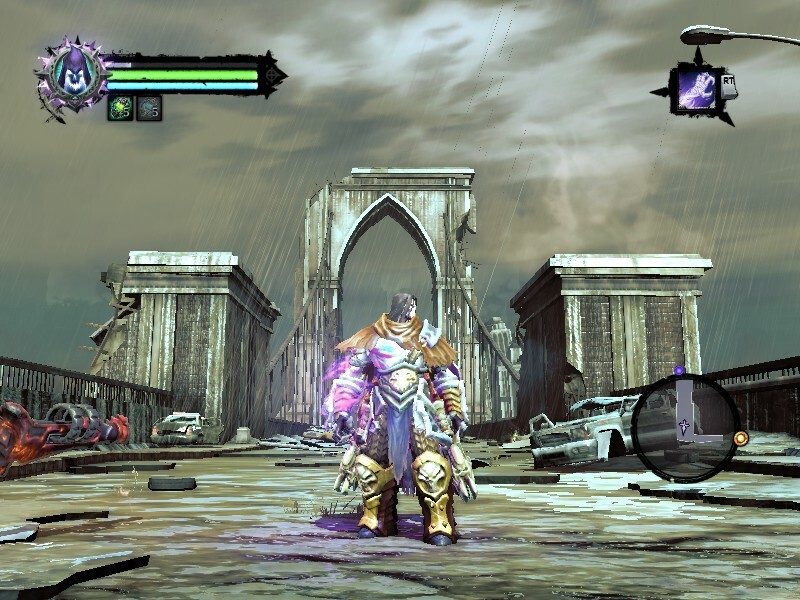 Unfortunately, unlike the first game, the story was really taken to the background and not given enough chance to enhance the game’s progression. The whole game just felt like it was a dungeon-fest. Go to one dungeon, acquire some item or find some character, then exit and go to another dungeon, rinse and repeat. It just seems to me a lot of the game was copy-pasted just for the sake of making it longer. I’d rather that it was only half the length but fresh, rather than long and diluted. 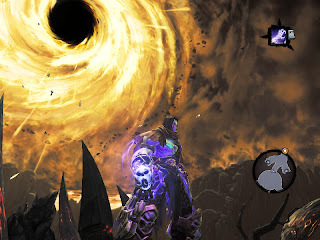 And to top it off, the final boss fight was pretty unfulfilling simply because it was just too easy for a final boss. Now there were also some side-quests to do, plenty of collectibles to get, and also the Crucible, which is an arena where you fight waves of enemies and progress further so that you can receive rewards. 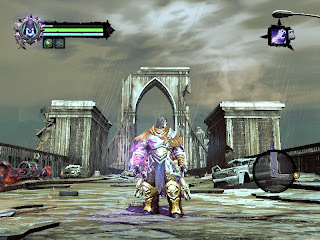 However, most of the optional content didn’t seem too thrilling to me and there was not much incentive for me to do it. Finally I was also a little disappointed that I came across quite a number of annoying bugs and glitches during merely a single playthrough. - There was one where after having paused the game and then unpaused, my character was stuck and unable to move. Quitting to main menu and then resuming seemed to solve the problem, but pausing again in that area made the character immobile once more. - The second glitch was in the Ivory Citadel part of Lost Light, when I had to solve a puzzle by shooting one portal THROUGH the other. For some reason it was impossible to do so and only after many dozens of attempts it actually worked. - And the third glitch was during a boss fight with Samael. That was the one boss fight I was most looking forward to, but it was sort of ruined a bit as he was stuck on the edge of the arena. Gladly, after I restarted the fight, the glitch did not happen anymore, so I could forgive it there. Overall Darksiders II is a pretty smooth ride, with very well done combat mechanics, a good variety in equipment and customization, a truly epic soundtrack, and some stunning locations. 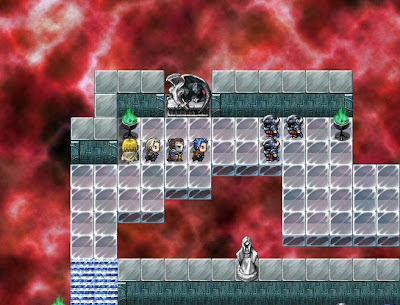 However, it fell down due to way too much repetition, especially when it came to dungeon design and the puzzles. This repetition really dilutes down the enjoyment and makes the game feel like a bit of a drag. Where to begin? First of, I decided to give E.Y.E. a try despite an overwhelming amount of negative critic and user reviews, but it seems in the end I might have to agree with a lot of them. Although it's not a terrible game, a lot of its flaws are still way too prominent, like ugly scars. The game has some really interesting ideas and a lot of promise and potential, but most of it is severely under-delivered. I have respect for the developers for doing a lot of things differently to conventional methods, but this also means they delved too far into the uncharted, experimental territory, and hence some areas turned out fine and other areas were a complete mess. In addition the game feels as though it was rushed, untested, and released in the alpha/beta stage. I'm going to break it down into several aspects now. First of, it's a mix of FPS gameplay with Role-playing aspects. The FPS mechanics actually work really well. 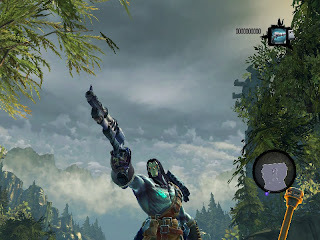 The guns are incredibly fun to use and the enemies are very responsive to being hit. Just as a simple FPS game it could've turned out quite well. The only drawback on this side perhaps would be that for some unknown reason the character never automatically reloads the gun once the clip is empty, which at times can be frustrating to the player (for example, try using a double-barrelled shotgun and having to manually reload after firing every 2 shots). Now as an RPG this game was a complete disaster. Although I really enjoyed the setting and some of the locations were really beautiful and had a nice cyberpunk theme, the game really failed to immerse the player. Bad translation and very bad dialogue are some of the things that made the setting less believable (e.g. does anyone know what an "embarrassing turret" is? Because I don't). The story manages to lose your attention pretty much after the first level. I think one of the problems also is the lack of voice acting. I think for a game like this, voice acting is an absolute must. One of the fundamental problems about this game is too much text, both when speaking to NPCs and when browsing through your character skills and stats. The fact that the text is small too makes it all the more annoying. The game also plays strangely. A single player campaign plays like a multiplayer map, with both you and enemies being able to respawn multiple times. 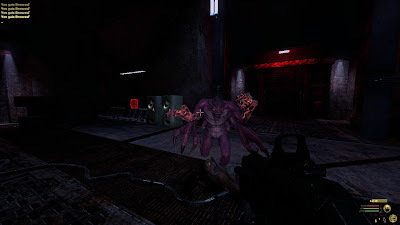 This is one of the things that really breaks the immersion as you see the same enemies keep repeatedly respawning at a spawn point as soon as you turn around and just rushing at you recklessly without any tactics. In addition the levels are way too big, often requiring tonnes of pointless walking and backtracking. I literally had to use my sprint power in order to get about, or else the game was a drag. And to make it worse, the game doesn't ever let you save. It only has a few auto-saves spaced far apart, usually at the end of each mission, which could go on for more than an hour or so. 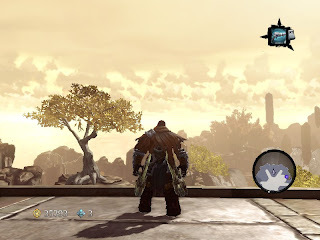 I think when playing this game, most RPG elements can be easily ignored. Just a run and gun tactic the entire game will get you far. The only RPG-related mechanic you need to know is how to get weapons from the armoury and into your inventory. The weapon inventory management was pretty cool, I admit. The hacking mini-game was also an interesting and refreshing addition, although at times it felt way too random and poorly tested. Also something I've really got to mention is the fact that to resume your campaign after having quit the game is a trouble in itself. First the game loads and takes you to a portal area, and then you've got to walk to the portal and it loads again before you finally get back to where you left the campaign. Now I don't see a point of having to bring the player to the portal area and make us wait through TWO loading screens instead of ONE. That is just poor game design. Overall to summarize, E.Y.E. has a lot of potential and interesting ideas, both relating to the setting and the game mechanics, but a lot of it is still in a very rough and unpolished state. 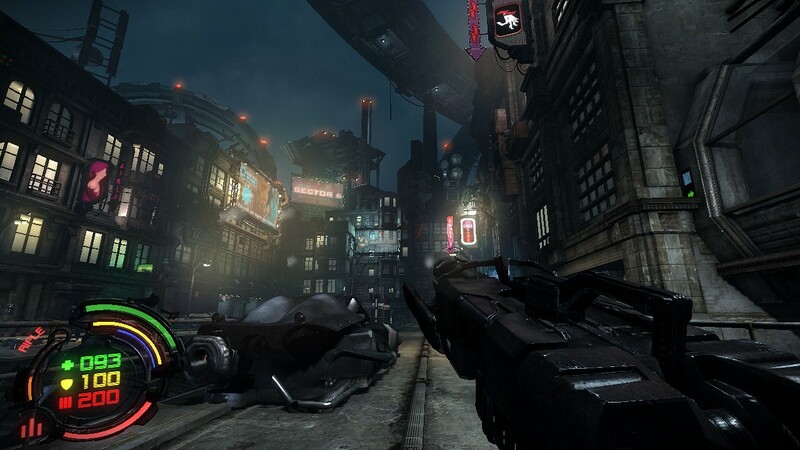 It plays well as an FPS, but terribly as an RPG. 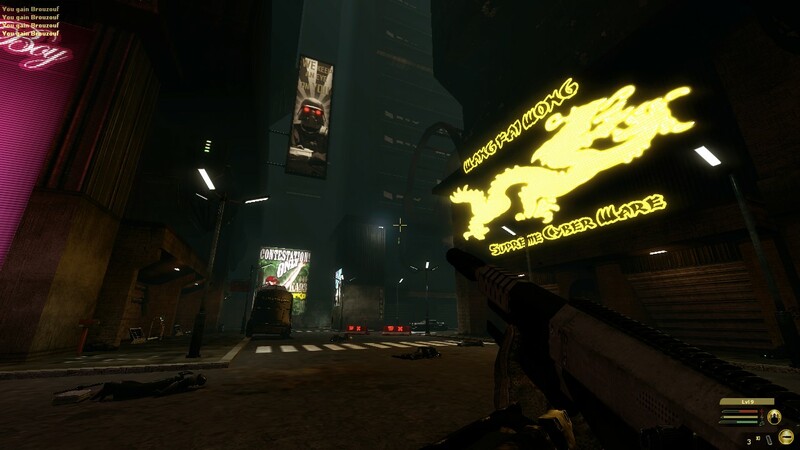 Therefore if to go round and shoot at waves of enemies is what you're after, then you might in fact enjoy this game, but if you're expecting an immersive first-person RPG, akin to Deus Ex, then you're in for a nasty disappointment. Hard Reset is a fast-paced indie shooter with beautiful visuals and an interesting cyberpunk setting. Perhaps what was most impressive about the game was the fact that the presentation was so top-notch and attention to detail so good that it didn't even feel like an indie game. As many would admit, the visual aesthetics are really stunning (even on low graphics settings) and the environments are atmospheric. The gameplay itself is quite straight-forward. You go round from area to area, fighting off groups of robots, and then upgrading to new weapons and facing a bigger challenge. Although this may seem repetitive, I personally have had a lot of fun, because there was a very decent variety between the different weapons. You have two types: the ballistics type (rifles, rocket launchers, etc) and the energy type (plasma guns, electric blasters, etc). 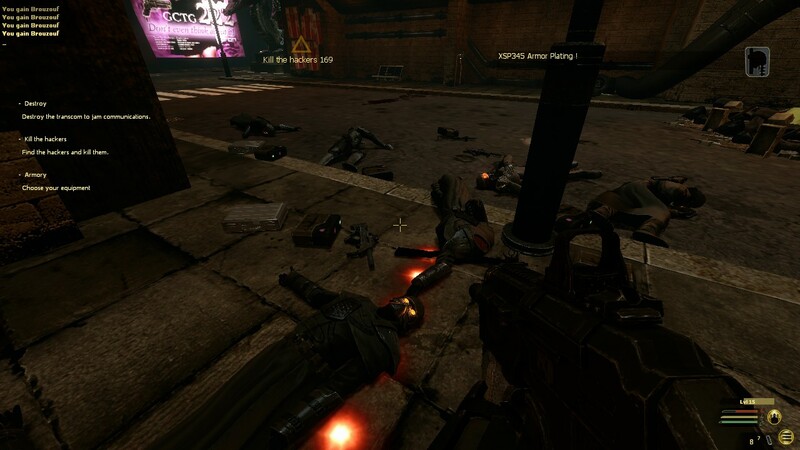 Each type had 5 different weapons you could acquire through upgrading, so that's 10 weapons in total really, plus each weapon had two different firing modes, so in a way you have up to 20 different ways to kill the enemies. And it's not like all the weapons are similar. 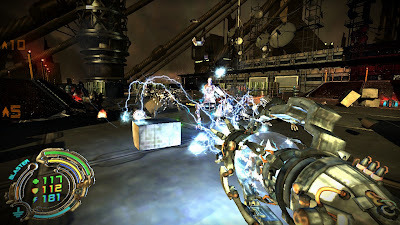 Each and every weapon could be useful in specific situations, for example electric blaster could make a short work of hoardes of smaller enemies, smartgun was great for small gunships which could move in the air quickly and dodge regular projectiles, whereas bigger enemies like bosses would require you to use charging plasma projectiles or maybe even the rocket launcher. I personally found myself using every single weapon at some point. The combat in general was a little more engaging than what you might expect. There were a lot of destructible and explosive objects in the environment, so using environmental kills was highly encouraged throughout pretty much the entire game, which was a really nice touch, because many games of this style tend to suffer from the lack of this feature. There were some interesting boss fights which were pretty challenging. In fact the whole game was challenging, but it has 4 difficulty modes, and Easy difficulty is really suitable for someone who wishes a more casual approach to the game. As for story, many would say it's nothing too special, but it did add some spice to the game, and the comic-book style cutscenes in between the missions were a really nice addition in my opinion. Admittedly the game isn't very long. It took me about 7 hours to complete the original game plus the Exile DLC, but this is pretty standard for single player FPS games, plus the game was fun enough and I am sure I will be back to it again in the future, especially that there are plenty of Steam achievements to get. And speaking of DLC, I thought it was really decent that the DLC was actually free and comes together with the original game at no extra charge. Now this shows that the developers are really passionate about delivering a good, satisfying game to the fans and not for dishing out extra cash. 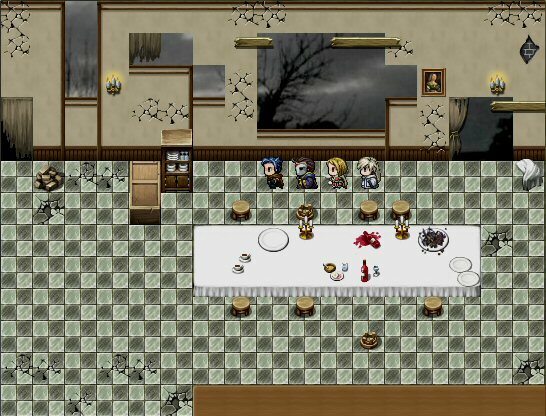 Thought I'd put another one of my games on here, which was made in RPG maker VX Ace. 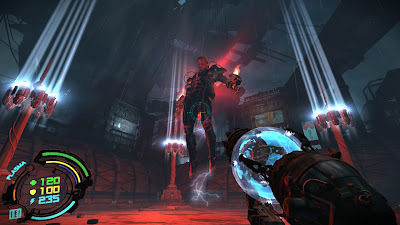 Dreadmurk takes place in the Underworld and follows a group of former villains and anti-heroes, who are trying to escape it. 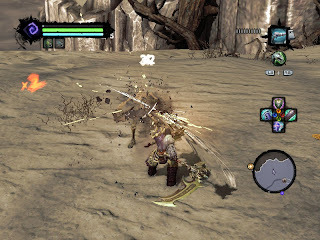 The game is about 8-10 hours long, depending on the player's pace, with random encounters and turn-based combat. Includes lots of puzzles, boss fights, and fun moments. Note: Only works on PC.